PRP Rating available only with engine supplement: DPA Ratings definition (According to standard ISO8528 1:2005) PRP - Prime Power: It is defined as being the maximum power which a generating set is capable of delivering continuously whilst supplying a variable electrical load when operated for an unlimited number of hours per year under the agreed operating conditions with the maintenance intervals and procedures being carried out as prescribed by the manufacturer. The permissible average power output over 24 h of operation shall not exceed 70 % of the prime power. LTP - Limited-Time running Power: It is defined as the maximum power available, under the agreed operating conditions, for which the generating set is capable of delivering for up to 500 h of operation per year (whose no more than 300 for continuative use) with the maintenance intervals and procedures being carried out as prescribed by the manufacturers. No overload capability is available. BASE FRAME: Base frame made of welded steel profiles, complete with anti-vibration mountings properly sized. The baseframe has a grounding point to connect all metal parts of the generating set and it provides a high structural strength. CANOPY: • Soundproof canopy made up of monolithic structure, built to achieve a high degree of stability and a protection against any kind of movement or infiltration. This kind of canopies are designed to meet a high standard of toughness and good noise attenuation as well as resistance to atmospheric agents, providing an integral solution ready for its installation both indoor and outdoor. 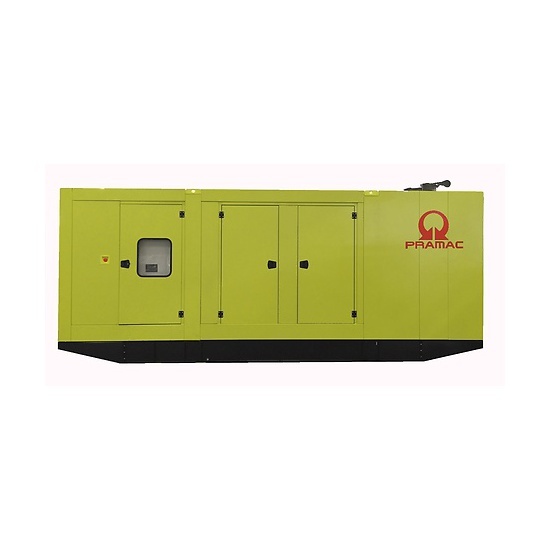 • Easy access to the genset for maintenance purposes thanks to: Wide lateral access doors fixed by stainless steel hinges and provided with lockable. • Control panel protection door provided with suitable window and lockable handle. • Lateral air inlet opening properly protected and soundproofed. Exhaust air outlet from the roof, trough wet section protected by proper grid. • Lifting points located on the roof to facilitate the transport.